Hortus Camdenensis | Iris latifolia Mill. Fully-hardy, bulbous iris with narrowly lance-shaped leaves and 1 or 2 broad, blue, violet, or occasionally white, flowers, with yellow centres in the falls, in summer. There are many cultivars, blue, violet, purple or white in colour, but never yellow. [RHSE, Hortus, Allen]. ‘A native of the Pyrenees. We are uncertain if Desfontaines means precisely this species or xiphium, or some other that has been usually deemed a variety. The name of "English Iris," which we find so commonly given to it by the older Botanists and even by the modern Florists, was acquired from the plant's having been first introduced into the Low-Countries from England, most probably without any notice of its true habitat, and hence presumed a native of our country by those that received them: Clusius says, that on his first arrival here in 1571, he sought for it wild, until he was informed by Lobel of its being only cultivated in certain gardens near Bristol, where it had been most probably imported by some vessel from Spain or Portugal. Gerarde includes it among the British plants, in which he has been followed by Dr. Withering in his Botanical Arrangements but Parkinson was aware of its real habitat. Flowers in June. Hardy and of easy culture seeding freely. The best bulbs are imported yearly by the Seedsmen from Holland, and should be put in the ground early in the Autumn.’ [BM t.687/1807]. Listed in all published catalogues [B.261/1843]. 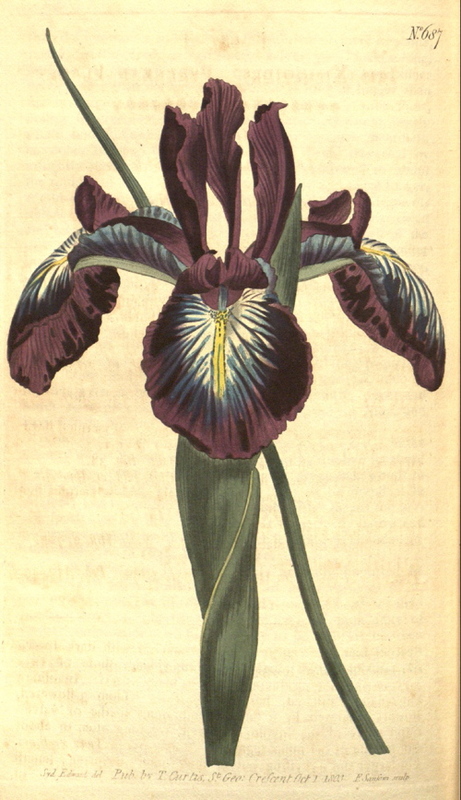 ‘English Iris’ recorded as received per ‘Sovereign’ February 1831. [MP A2948]. Iris anglica Hort. ex Steud.